Summary: Basement wall insulation is needed if the basement is heated. Basement ceiling insulation is needed if the basement is not heated. Carl, Is there any advantage to insulating the basement ceiling before drywalling or should I just save the cost? David, if your basement is part of your living area, and since you are dry walling it I assume it is, you’ll want to insulate its walls, not the ceiling. If you want sound proofing you could add some rigid board insulation, but to insulate the ceiling would be a waste of money, and probably make your floors upstairs colder in the winter and your basement warmer in the summer. Heat rises, cold air settles and these scientific facts are calculated into sizing residential heating and air conditioning systems and work to your advantage. You want heat to rise until it gets to the “end of the line’ which is your attic. The attic is where you want to stop heat loss and attic insulation is where you spend your extra insulating money. Windows, exterior doors, cracks (air spaces), exterior walls are the next big energy thieves and in that order, with windows being the biggest thief of all. But getting back to the basement, basement walls are usually made of brick, concrete, cinder block or stone—materials with very poor R-values. You’ll lose a lot of heat through them unless they’re insulated. 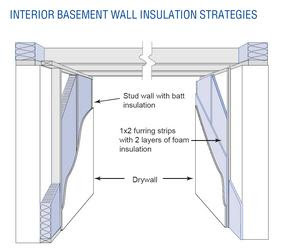 Basement walls insulation can be done from the inside or outside. Regardless, the job requires the expertise of a professional as improperly insulated basement walls can damage a home’s foundation. For finding out more about how much insulation you need for basement insulation, crawlspace insulation, wall insulation, and attic insulation, plus a FREE insulation calculator that is easy to use, and an R-value chart for the USA, read my page on calculating how much insulation you should have. For additional information, contact your local gas or electric utility, and a professional insulation contractor.